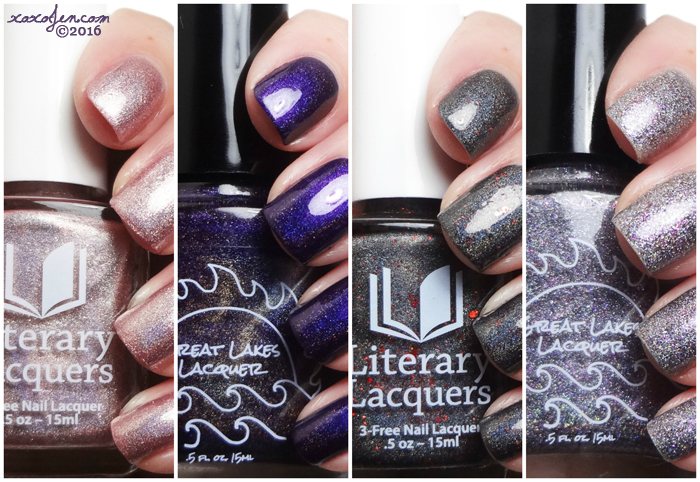 I had the honor of reviewing four beautiful polishes made by two brands that I enjoy wearing, Great Lakes Lacquer and Literary Lacquers. These were originally a duo that overflowed into a quartet for Great Lakes Lacquer's one year anniversary. Inspired by "The Stand" by Stephen King, each brand created a polish inspired by a good guy and a bad guy. The pre-order opens on Tuesday, July 12th at the Great Lakes Lacquer shop and closes July 19th. The polishes are sold together as a set and will be shipped within twelve business days. M-O-O-N, That Spells Purple: Inspired by Tom, the hero with the big heart. 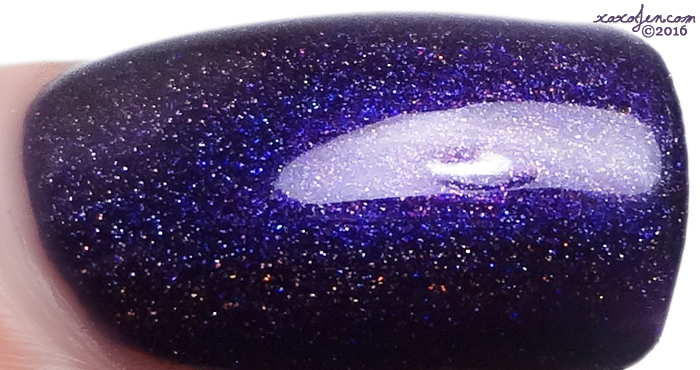 A midnight purple with shifting blue to gold to red shimmer and a linear holographic effect. Super rich grape holo with a smattering of gold shimmers (check out the bottle in the photos) - how could I not love this? I wore two coats to ensure opacity for photos, but one carefully applied coat would do it. My Life For You: Inspired by Trash Can Man, the construct of destruction. 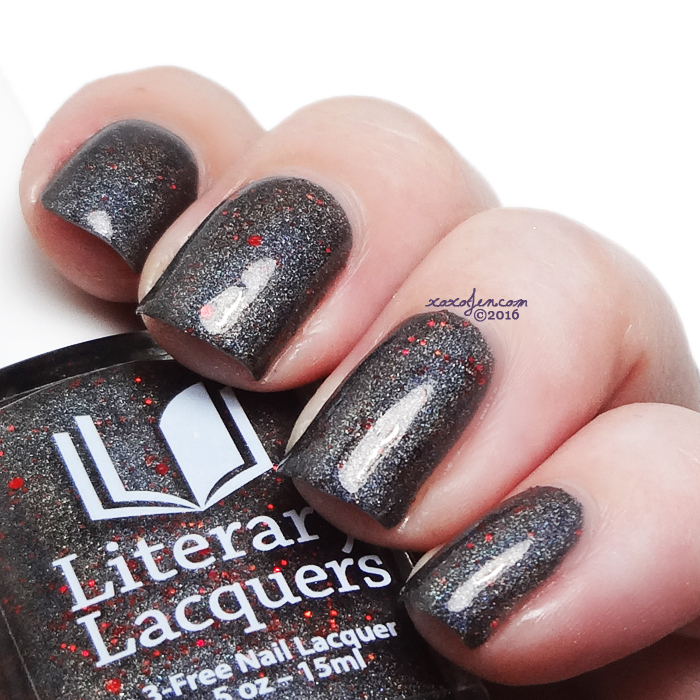 A dirty silver holographic micro glitter with charcoal flake, burgundy micro glitter, and shifting shimmer. Full of sparkly goodness and depth far beyond the sea results in a polish I couldn't take my eyes off of. It sometimes looks a bit like a smokey lilac shade, at other times it's a bright sparkly rainbow and sometimes it looks a bit pink. It has a fantastic formula, is not topcoat hungry, and is opaque in just two coats. I don't see how it could be any more perfect than this! Mayhaps You Is: Inspired by Mother Abagail, the 108-year-old leader of the "good" survivors. 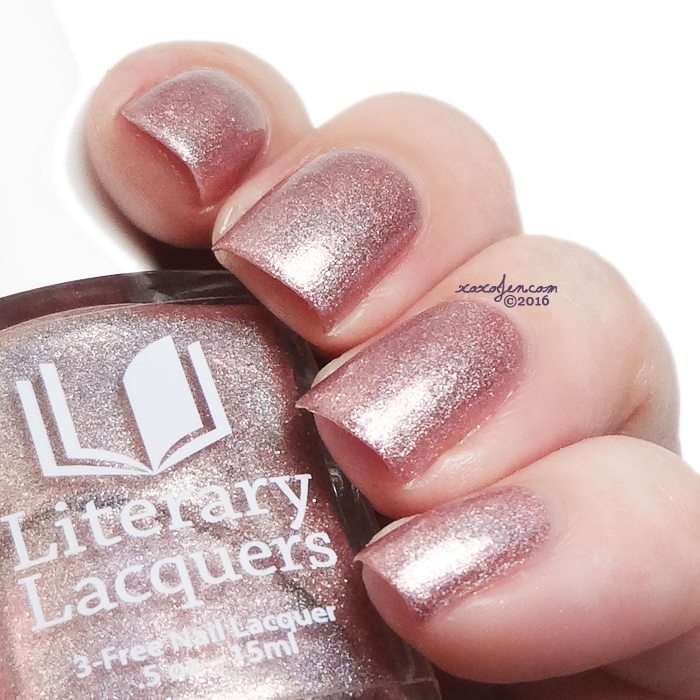 Shimmering rose quartz linear holo. 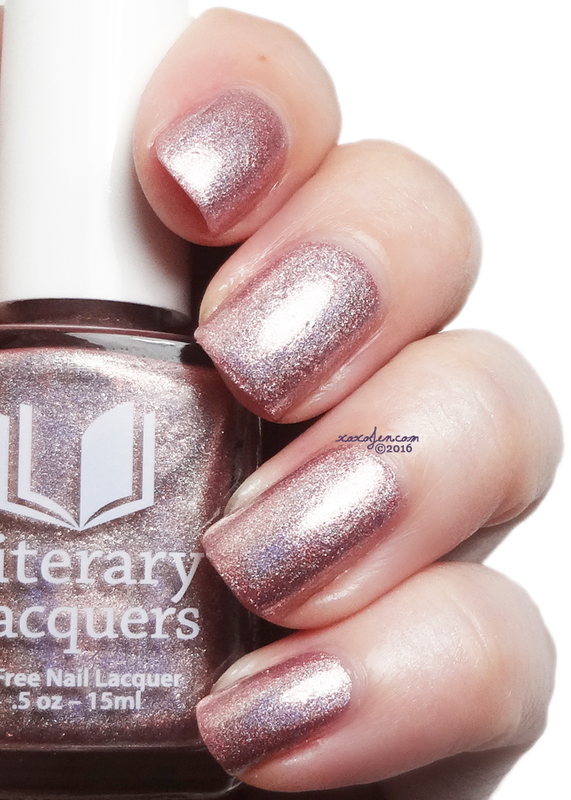 This polish is super sparkly and holo in the sunlight, and really shiny metallic in the shade. The flakies in the polish add a little extra oomph in any lighting. I wore two coats with topcoat. The Eye, The Key: Inspired by Randall Flagg, the embodiment of evil. Golden sheen obsidian linear holo with red holo microglitter. 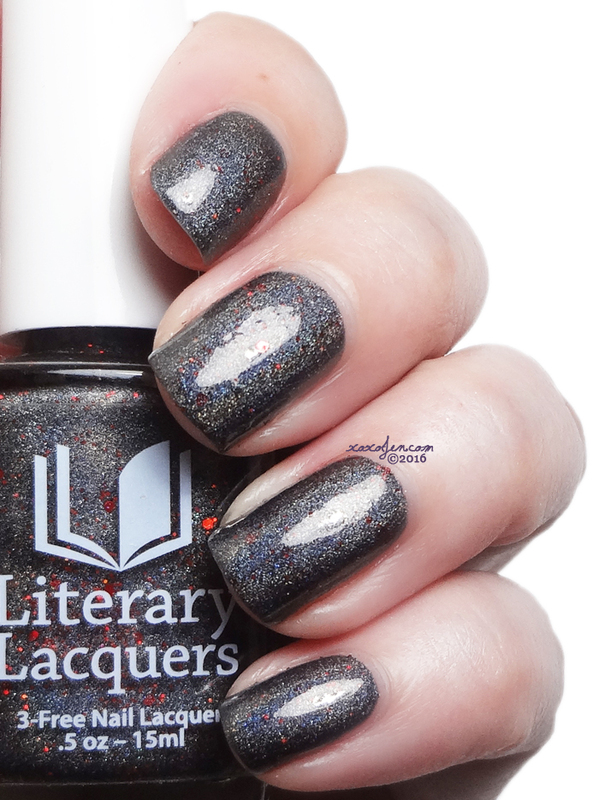 Dark yet sparkly and holographic with a great formula. What's not to like? I do believe this polish is unique in my collection and I don't recall having seen anything similar to it prior. I love the look of almost black with red, this would be great to wear with a 'little black dress!' I wore two coats with topcoat. I hope you've enjoyed the review and photos and I look forward to hearing what you think of them! Some nice colors you swatched here! That's a collection of gorgeous polish! I especially am drooling over The Eye, The Key. Hahah, just when friends and family think you have every color and finish of polish possible (no me, though - I would never think something that silly. :) ), they come out with more unique pretties! I agree wholeheartedly! Some just don't understand that polish colors may be similar but not the same. Glad to see we're like-minded in that regard!